The USGS EarthExplorer provides search and order capabilities for satellite images, aerial photographs, and cartographic products. ASTER L1B and L1T data, the ASTER GDEM, and NAALSED products are available for download at no cost to registered users. 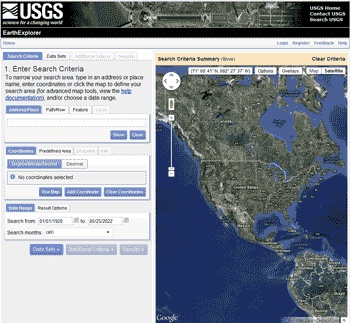 Users may register for a USGS account via the "Register" link on the EarthExplorer main page. In the "Search Criteria" tab, users select their desired area and temporal range. The area of interest may be selected interactively with the Google Maps interface, or by entering an address, path/row, feature, or coordinate(s). Under "Data Sets," the user selects the dataset(s) to be queried. ASTER datasets are located under "NASA LPDAAC Collections." The ASTER collections, available at no cost to all registered users, are the ASTER Global DEM, ASTER L1B and L1T data, and NAALSED (North American ASTER Land Surface Emissivity Database). The "Additional Criteria" tab allows the user to specify additional constraints specific to the dataset selected. For example, a user searching for ASTER L1B data may filter by cloud cover, day/night collection, and instrument mode. Once all parameters are set, the "Results" tab returns the dataset results. The search area is displayed on the Google Map interface, and available datasets are listed in the left sidebar. The user may overlay scene footprints and browse images on the map, view metadata, and select desired scenes for download.